There are many hardware fasteners that have appeared in the automotive trade ranging from square head nuts and bolts, Phillips head screws to today's Torx fasteners. As our restoration projects continue to challenge us, we continue to seek hardware and fasteners to overcome problems. 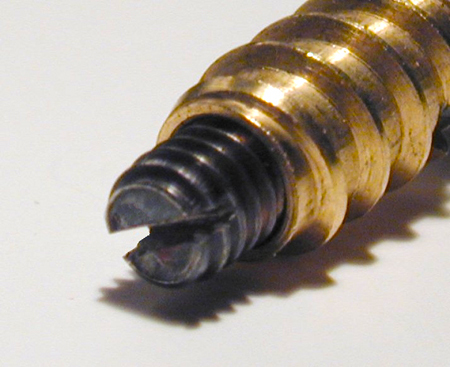 Helicoils are a good example and to this list we can add the Threaded Rivet or Slot-less Screw. It is a simple fastener that has the appearance of a rivet, a domed head with no visual signs of using a tool to tighten its grip. Down its shank, it has standard US threads that accept common nuts. They can be used to fasten hardware or panels just as a regular machine screw might be used. While the threaded rivet is not necessarily new, the use for trunk restoration is one application that should be considered. Automobiles, beginning in the teens through the 1930's, included a box like container on a special rack to store personal articles, spare auto parts, or reserve fluids like gas, water or oil. These trunks evolved into special sizes and features to appeal to the car buyer and to accommodate the auto manufacturer's manufacturing process. They often included long piano hinges, strap hinges, latches and decorative metal strips. All these hardware items were originally fastened using a lead covered nail. Over the years these nails would loosen and the hinges and hasps would fall off, essentially making the trunks useless. Using threaded rivets instead of nails provides a significantly better way to fasten the trunk's hardware. The holding strength of the threaded rivet is superior to that of nails, especially if the wood has been weakened from previous nail holes. Threaded rivets are available in a variety of screw sizes of 4-40, 6-32, 8-32, 10-32 and 1/4-20 and most sizes have head shapes of either round or truss head. Length's vary from 3/8 inch for the smaller 4-40 to one inch long for the 1/4-20 size. They are available in stainless steel for all sizes and in brass for some sizes and head styles. Prices range from .20 to .90 cents each depending on vendor, size and head style. A significant advantage of using the stainless steel version is that they can be polished to provide a long lasting high luster appearance. Suppliers of threaded rivets are Restoration Supply Company, Escondido, CA or Material Search Company (MSC) near Pittsburgh, PA. 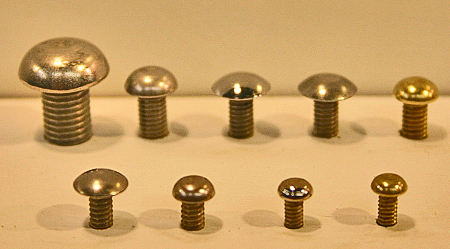 Examples of threaded rivets. Back row, left to right, 5/16-24 stainless steel round head, 10-32 stainless steel round head, 8-32 polished stainless steel truss head, 8-32 stainless steel truss head, and 8-32 brass round head. Front row, left to right, 6-32 stainless steel truss head, 6-32 stainless steel round head, 4-40 polished stainless steel round head, and 4-40 brass round head. In this article, we are using the threaded rivets to fasten hardware components onto the trunk. Examples are the trunk handle loops, strap hinges, piano hinges, handles or pulls, latches & clasps, and decorative metal or leather straps. These are the pieces that would be fastened after the exterior of the trunk has been covered, but before the inside lining has been installed. Whether refurbishing an existing trunk or building one from scratch the threaded rivet will aid in fastening these hardware items and give you a more finished look. 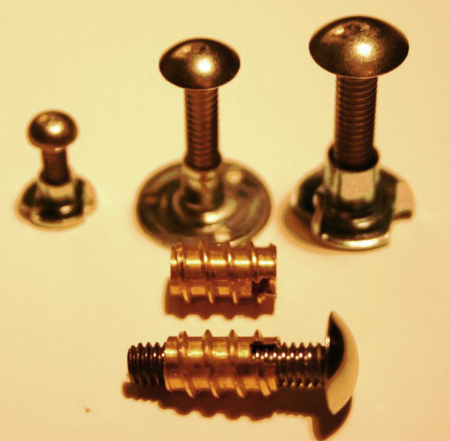 The technique presented here is using the threaded rivet with either brass threaded wood inserts or Tee nuts, available from 1) the local hobby shop, 2) directly from Micro Fasteners, or 3) the industrial supplier McMaster-Carr. The wood inserts from Micro Fasteners are small and may suit the thin wood found on trunks better than other versions. Threaded inserts shown with threaded rivets. Shown are 10-32 inserts on the left and 6-32 inserts on the right. Model airplane and boat builders use these small brass inserts wherever there is an application to repeatedly fasten and remove covers or hatches. To aid in tightening the threaded rivet, a Dremel tool with a thin cut off wheel is used to cut a slot across the tip of the threads where a small slotted screwdriver can be used from the back side. To aid in tightening the threaded rivet, a high speed rotary tool such as a Dremel and thin cut off wheel is used to cut a slot across the tip of the threads where a small slotted screwdriver can be used to tighten the rivet from the back side. Small nuts and washers could also be used, but the benefit of using inserts and Tee nuts is to conceal them into the wood. 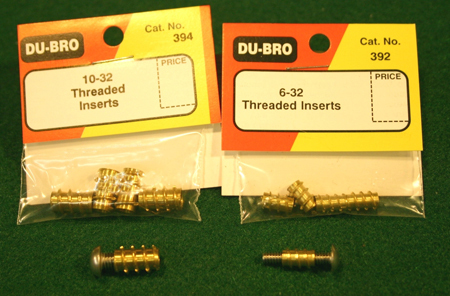 Threaded rivets shown with brass inserts and Tee nuts. The brass wood inserts are set into place by drilling the appropriate size hole in the wood using brad point drill bits. 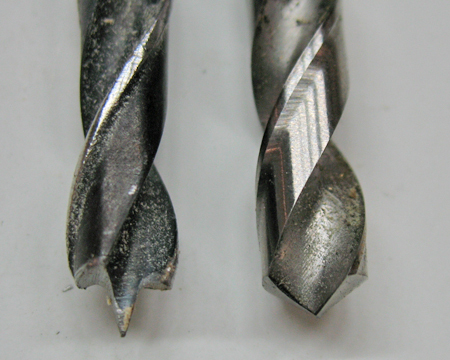 Comparison of a brad point drill bit (left) and a regular metal cutting bit (right). The brad point bit ensures accurate location of the hole for the insert. Drilling and inserting the numerous brass inserts can seem time consuming, especially when a piano hinge is involved, but the finished results are outstanding. Use of home made threaded mandrels (turned on a lathe and threaded using a Die) and your favorite cordless drill driver makes setting these effortlessly. Threaded inserts can be set using home made mandrels and your favorite drill driver. 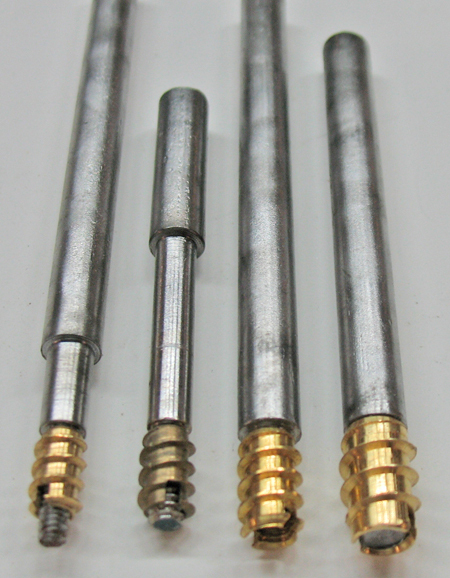 Left to right are the 4-40, 632-, 8-32, and 10-32 mandrels with their respective brass inserts. Note the slot on the insert is a thread cutter into the wood and is not for using a flat blade screw driver. 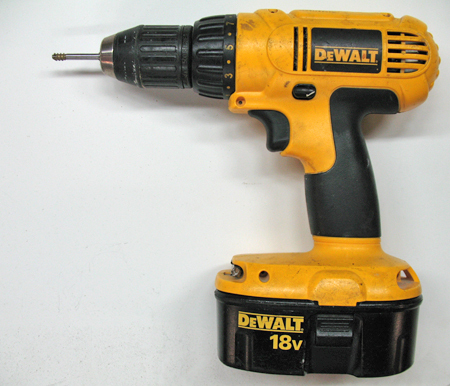 A cordless drill driver makes drilling the hole and setting the brass insert quick work when setting many inserts. Shown in the chuck is the 6-32 mandrel and an insert. Using the mandrel, drive them slightly below the surface. Note the brass insert is oriented with the slot into the wood first. The slot is for cutting the threads, not for a flat blade screw driver. The quick reversal of the driver will unthread the mandrel while leaving the insert in place. Each brass insert should be trial fitted with a machine screw to ensure no burrs developed while setting the brass insert. Also, the use of Kwik-Poly may be considered to improve the strength of weakened wood panels or to set a pesky brass insert that isn't holding. As mentioned earlier, the inserts are set prior to covering the exterior of the trunk. After the outer covering has been glued on, each of the holes can be located and a small hole cut using an Exacto knife. Each threaded rivet is set by first screwing it by hand and finish tightening it using a small slotted screwdriver from the inside. Since you are screwing the rivet in from the "back" you turn the screw driver the opposite direction you would when tightening from the "front" (i.e. unscrewing it). The inside material (cloth or paper) will eventually conceal these small holes. 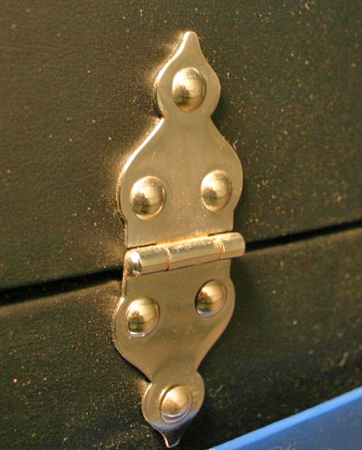 Photos below show the application of threaded rivets for typical trunk hardware. 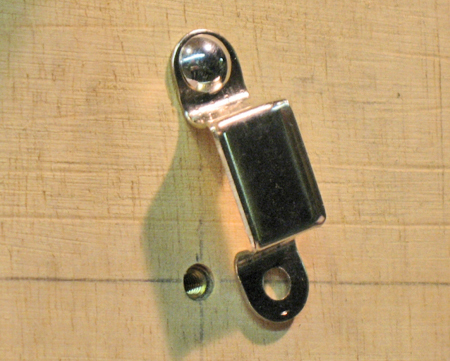 A piano hinge from McMaster-Carr is a good example of using threaded rivets. Holes are first drilled into the hinge and drill marks placed on the wood using a transfer punch. Brad point bits ensure accurate location for the brass insert and eventually the threaded rivet. 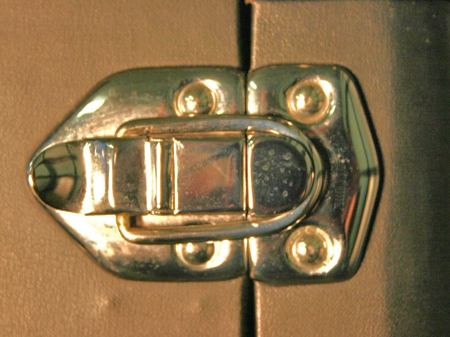 A trunk handle loop is fitted with a threaded rivet. Notice the brass insert is seated just below the surface. A trunk hasp latch is fitted using both threaded rivets and machine screws. Temporarily using machine screws makes it easier to locate mating pieces during fitting and will be replaced with threaded rivets after the trunk is covered. Finished view of a hasp latch after the trunk is covered. 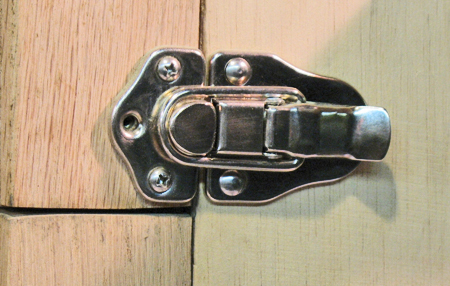 This latch was plated and used polished stainless steel truss head threaded rivets. 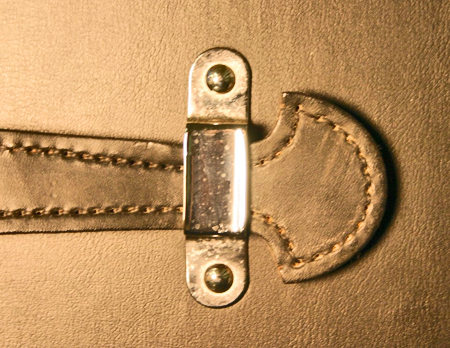 Finished view of a strap hinge after the trunk is covered. This hinge was plated and used polished stainless steel truss head threaded rivets. Finished view of a handle loop after the trunk is covered. This loop was plated and used polished stainless steel truss head threaded rivets.